A gunman opened fire at multiple locations across a small Northern California community on Tuesday, killing four people before he was slain by police. 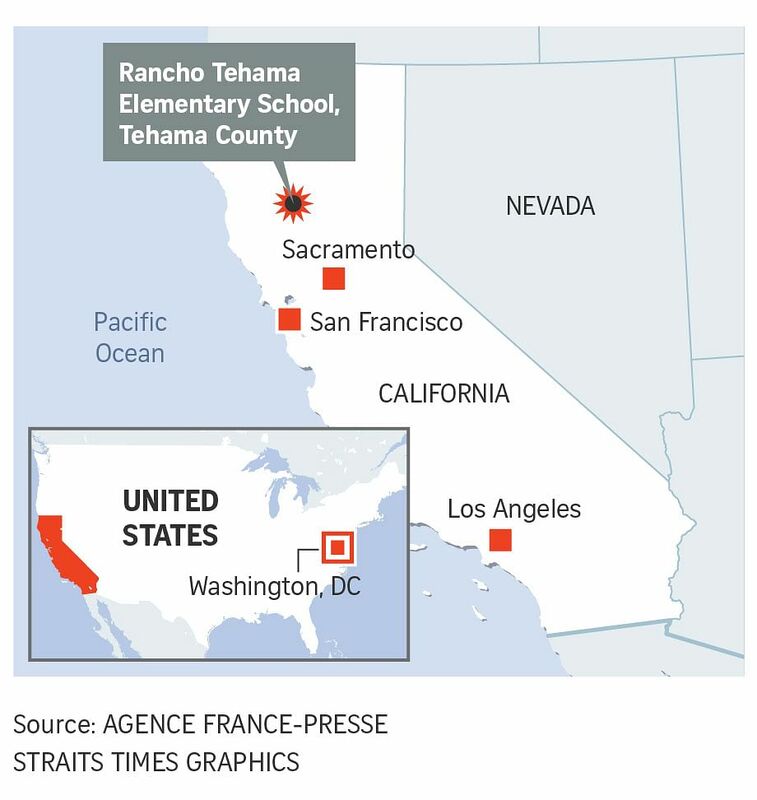 LOS ANGELES (AFP) - At least four people were killed and nearly a dozen people were wounded, including three young children, when a shooting broke out on Tuesday (Nov 14) at a school in rural northern California. “He said he saw bullets strike the truck in front of him and he put his children down to protect them and put his truck to... reverse,” Schultz said on Twitter. Area resident Brian Flint told local media that his roommate had been shot and killed by the gunman, a former convict in his 50s. “We made it aware that this guy is crazy and he’s been threatening us,” he said. The shooting coincides with a new flareup of the long-running debate on America’s epidemic of gun violence and the ready accessibility of high-powered weapons, less than 10 days after a gunman shot dead 26 people at a church in Texas. Johnston, of the Tehama County Sheriff’s Office, told reporters that three weapons – a semi-automatic rifle and two handguns – had been recovered from the scene. He added that the victims were randomly targeted by the gunman in multiple locations. “I know that we have medevacked (airlifted) a number of students, I know that the school has been cleared, I know that we have the children that were attending school in a safe location at this time,” Johnston said. Some 100 law enforcement officers responded to the shooting, and students at the school have been safely evacuated, he added. It said initial reports indicated the shooter had barricaded himself inside a building before being shot by police. Katrina Gierman, who lives near the school, told the paper that she heard the gunshots and had locked herself in her home with her newborn son. “I have the right to bear arms, and I will protect my son if I have to,” she said. The elementary school is located on the outskirts of Corning, an olive oil-producing town of around 8,000 people about 160km north of the state capital Sacramento. Jason Wandel, chief division counsel at the FBI’s Sacramento field office, told AFP that agents had been sent to help with the investigation but wouldn’t confirm any details regarding the incident. More than 33,000 people die annually in the United States from gun-related deaths – two thirds of them suicides – according to the Centres for Disease Control and Prevention.